2014 J. Bookwalter, Merlot, Book Club Select, Columbia Valley AVA, Washington State. One of Washington State’s top producers, J. Bookwalter is known for their Cabernet Sauvignon, but like Leonetti do a fabulous Merlot, and with its striking deep color and ripe richness, these wines are hard to resist, especially their Wine Club release Book Club Select from the renown Dionysus Vineyard, which is a site of special character, as the winery notes, it has been long chosen for its perfume and refined tannins. Bookwalter was founded back in 1982 by Jerry Bookwalter, with a long background in agriculture, who had moved to the area, Eastern Washington, back in 1976, and from 1976 through 1982, Jerry helped manage the plantings of three iconic vineyards – Sagemoor, Bacchus and Dionysus, as well as later became vineyard manager of the famed Conner Lee Vineyard which remains the largest source of grapes for J. Bookwalter wines. These vineyards helped put Washington on the map and have been the source of great fruit for many other celebrated wineries. J. Bookwalter is now run by John Bookwalter, who is the tenth generation to be involved in the family farming business and has taken the Bookwalter label to new heights in recent years, having hired world-renowned consulting winemakers Zelma Long and Claude Gros to raised the quality and the profile of this outstanding label and in he was able to bring on the celebrated Caleb Foster, who is recognized as one of the top winemakers in the United States, who since 2014 has lifted the winery to new heights. The Dionysus Vineyard is located together on the dramatic banks of the mighty Columbia River on the southwest facing hillsides where ice age floods exposed the various ideal gravel beds, and on this steep gravelly hillside it makes for intense and powerful Merlot, but with Pomerol like finesse even though it is opulent and new world dense. Foster has been making wine in the region since 1992 and has an amazing understanding and touch with the grapes grown here, with this 2014 Merlot being one of his first start to finish wines for Bookwalter, and his talents, clearly showing here, have really paid off for the winery. 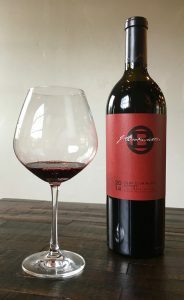 This 2014 feels remarkably fresh in the glass and it takes a few minutes to unfold with sweet blackberries leading the way along with espresso bean and bitter coco before opening up on the expansive, but tightly wound palate, giving black cherry, anise, incense, cedary wood notes and lingering creme de cassis. Air time leads to more complexity and roundness adding earthy mulberry and smoke, and even at about 14.8% natural alcohol it somehow stays lively, never getting bogged down or feeling hot, and the tannin structure is more in line with a Cabernet Sauvignon based wine, it’s impressive and needs robust cuisine to compliment its depth and fullness of flavors. I can imagine this wine aging 10 to 15 years easily without losing a thing, though the window is starting now even, but I suggest decanting and or a hearty meal to allow this Merlot to show it’s best.